On the 9th of March, the 5th and 6th class pupils of St.Andrews made their confirmation which was their 4th sacrament so far their Christian lives. The weather was lovely that day. The ceremony started at 11 o’clock on Wednesday morning. Bishop Michael Smith and our parish priest Father Brendan Ferris said the mass. At the start of the mass we went up to the altar and sang our opening hymn. 3rd and 4th class were all in the choir and they all sang beautifully along with our conductor Mrs.Horgan. Durning the mass we sang, said the readings and brought up gifts. After mass we all went back to our school hall and the Parents' Association had lovely cakes, buns, sweets and more. We also received certificates from our school teacher Miss Brogan who work very hard to make the day special for us along with the other teachers . After the school hall we all continued the celebrations with our families. We all enjoyed the day very much. On March 2nd 2016 at 7:30 in the evening all of second class from St. Andrews National School made their first confession. Do you know that your first confession is also called your first reconciliation and is the sacrament of penance? It was a special night and all the children went to the church with their parents and brothers and sisters. Father Brendan welcomed everybody to the church. Each of the children took turns to read out prayers or stories from the Bible on the altar. Fr Brendan spoke about the good shepherd searching for his lost sheep and about us asking God to find us and forgive us for the wrong things we have done. So we all knelt down and said the Confiteor. Then we each had our first confession on the altar with Fr Brendan while our parents stood close by. Everyone got a prayer after confession for example I got Hail Mary. We then had a prayer for the parents and Fr Brendan congratulated us and told us to go in peace. On the 15th of March the raising of the flag ceremony was held in the hall of St. Andrews N.S. 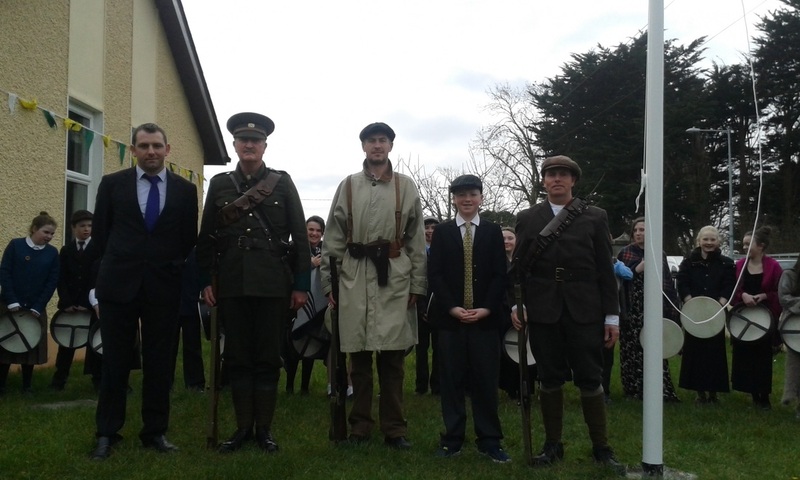 Each class in our school had been preparing their own plays and songs as part of the celebrations and we were joined by the Ashbourne 1916 Re-enactment Group who were dressed as Volunteers for the rising complete with fake rifles! The senior school sang “Fair Fair Land” first. After that some of the students played traditional music, the instruments that were used were the violin, cello, bodhran, recorder and piano. Junior and senior infant’s play was about toys they would have had in 1916. 1st and 2nd’s play was about a boy who made a time machine and made people from 1916 appear. 3rd and 4th’s play was about the Ashbourne Rising and the commanders. 5th and 6th’s play was about the signatories. David Dowse and Emily Heather read our school's proclamation and asked everyone to follow us as we walked out to raise the flag. 5th and 6th played the bodhran as we marched out. There was a great atmosphere as we marched out.We sang the National anthem and then Mr Brennan and Matthew Brennan (no relation!) unfolded the flag and it was raised by one of the 1916 Re-enactment group. It was a great day and I think we all felt proud to be Irish especially when we think of the sacrifices that were made so that our nation would be free to rule itself.